«Fliegenpflicht f«r Quadratk«pfe« («Bow Tie Duty for Squareheads«) was without question one of the most popular and successful German short films of recent years, causing a sensation across all festivals and winning a host of competitions in completely different categories: the Children«s and Youth Competition at Oberhausen, the Audience Award in the International Competition at Annecy, Grand Prize at the Kunstfilmbiennale Cologne. The maker of this amphibious film is named Stephan-Flint M«ller and has just begun his studies at the Academy of Fine Arts in Hamburg. Born in 1981 in Berlin, the filmmaker already displayed in his very first photographs an interest in exploring different viewpoints and perspectives. Slight manipulations of the pictorial composition yielded surprising and above all amusing distortions. M«ller took this quest for disarming effects with him when he turned his attention to moving images: «optical sleights of hand«, as one journalist put it, are at the heart of his work. As tools he uses close-ups, zooms and long shots, along with improvised placards that are panned or swung into the frame only to alight in front of building-sized advertising posters and become part of the commercial message. The festival world first took notice of M«ller with his «Nasse Zigarren f«r Berlin« («Wet Cigars for Berlin«), a work that today appears somewhat infantile, filmed in 2002 against the backdrop of the Bundestag elections and edited in 2003. M«ller at first found his film «embarrassing«; it was only upon noting the enthusiastic reactions of viewers that he decided to finished editing it and submit it to festivals, as well as to screen it for people outside his circle of acquaintances. Except for the brand of humour, which at that time aimed more at defamation and sometimes hit uncomfortably below the belt, the methodology behind his work has changed little. In «Wet Cigars for Berlin« we already find everyday logos, traffic signs and campaign posters subject to alienation effects or simply to being attacked with flour and eggs. Around 12 minutes of this same type of collage form the basis for «Bow Tie Duty for Squareheads«. The film-collage homage to Berlin has no apparent plot: «A 22-year-old Berlin «Flitzpiepe« [Berlinish for «prankster«] presents methods for lastingly chasing away boredom« says a text placard at the beginning « reminiscent of silent-film-era strategy « but this statement is not followed by much content. The film moves back and forth between experimentalism and animation, but is above all humorous, without placing too many, or too few, intellectual demands on the viewer. While the filmmaker plays with changes of perspective on the technical level, on the visual level he presents continually new associations between image and language, managing to give the things around us new meaning. 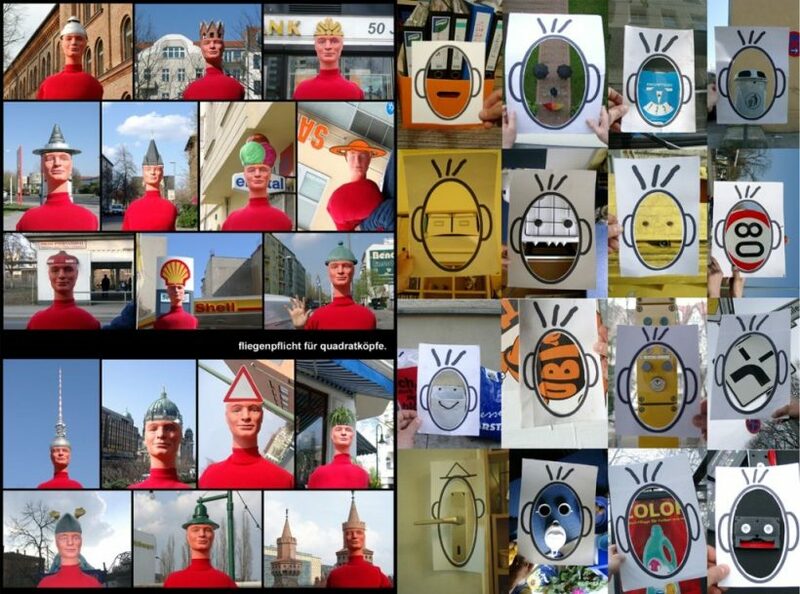 A shop window mannequin whose headwear includes the Berlin television tower and various advertising signs, speech bubbles made of cardboard that emerge from the mouths of real people, a soundtrack of happy music or word fragments recorded with rudimentary sound equipment: by combining two-dimensional signs with three-dimensional reality, M«ller makes fresh comments on urban reality, while showing it to us from an alien viewpoint. To put it abstractly: the film represents a playful encounter with the images and iconographies of a big city. «Bow Tie Duty«« was readily understood by international audiences and was passed around from festival to festival before finally winning the 25,000 « BILD-KUNST Promotional Award for Experimental Film. The jury praised it for its unique visual humour with which the «artist« had succeeded in stirring up the usual «order of the consumer world«, instead celebrating «chaos«. This admission to the «art world« comes as a surprise since the filmmaker himself consciously abstains from intellectualism and consequently does not include any deliberately intended references to other representatives of experimental film in his works. The spontaneity inherent in their making is at the same time the greatest shortcoming of M«ller«s films. They are usually shot without a concept or screenplay, which, particularly in the case of «Bow Tie Duty for Squareheads« leads them after a time to lose steam. It will be exciting to see how Stephan-Flint M«ller manages in future to bring his exuberant inventiveness into a more cohesive form, without forfeiting his spontaneity. After all, the irrepressible zest for image production expressed in his films is the very thing M«ller stands for: film not as brainchild, but rather as the unbridled delight in putting an idea on celluloid and splicing it into shape on the cutting bench. How well Stephan-Flint M«ller succeeds at this fusion of intuition and concept is something his fans have been waiting to see for quite some time. After the furore surrounding «Bow Tie Duty«« died down, he has since realized only some small film projects for competitions and contests. But he is now launching preparations for his next film, on a theme that will surely make many sit up and take notice: it«s about depression.